You arrive at our fully step-free reception lobby through the automatic sliding doors. The reception counter has of course been lowered to half-height. Our reception is manned around the clock. If you need a shower stool or other aids please inform us before your arrival. Our lift has braille writing. Automatic door openers are available in the reception area, the restaurant and the conference area. All rooms are accessible by lift. Our corridors are wide and easily accessible for wheelchair users. You can choose from four different categories: Classic room (16), garden view room (15), garden view room with a balcony (5) and an apartment. All of our rooms are very spacious and offer you at least 20 square feet of space, giving you plenty of room to relax. All rooms are furnished in a modern and comfortable way with a telephone, LCD TV, free internet access via LAN and WiFi and a step-free shower in the bathroom. All rooms are of course wheelchair accessible. Our classic rooms have 20 square meters of space and are equipped with a step-free shower. Four of the classic rooms are wheelchair suitable according to DIN. Of our 16 classic rooms, four are specially geared towards the needs of wheelchair users. They comply with regulations according to DIN 18025-1. The bathroom is considerably larger than in the other rooms so that wheelchair users can move around comfortably and without restriction. In addition, these rooms also offer sufficient space for the necessary wheelchair turning radius in front of the beds. Garden view rooms are identical to the classic rooms (20 square meters and a step-free shower), but they also offer an unparalleled view over our beautiful 3,000 square meters of gardens. These rooms are also 20 square meters and feature a step-free shower. In addition, you can enjoy taking in the Berlin air on the balcony whilst you enjoy views over our wonderful gardens. The apartment is on the 6th floor and offers the special feature of a 20 square metre roof terrace. This has step access. If you have any problems using the terrace please just let us know. Our restaurant is at ground level and accessible. 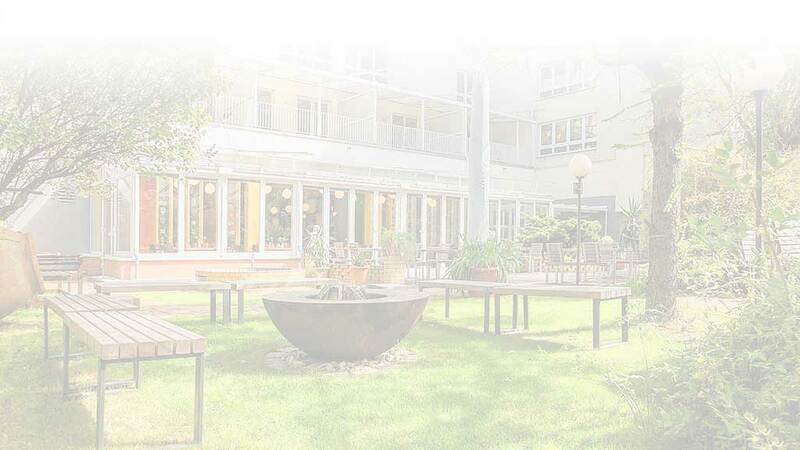 You can go through the restaurant with no problems and have step-free access to our terrace and garden. In the restaurant area there is a disabled toilet available; this conforms to the DIN regulations and can be navigated both from the front and side. You can access our bistro from the street side via a ramp or step-free from our gardens. There is also a disabled toilet in the bistro which conforms to the DIN regulations and can be navigated both from the front and side. Our large conference room can be accessed via the disabled lift within the hotel or by ramp from the garden. There is also a disabled toilet in the conference area which conforms to the DIN regulations and can be navigated both from the front and side. From the ground level of the restaurant, conference rooms and bistro you can access our wonderful gardens and explore the numerous paths that lead through the garden. They have stone slabs so that those with walkers, wheelchairs, pushchairs and walking aids can explore the garden without any problems.